The F8F prototypes were ordered in November 1943 and first flew on 21 August 1944, a mere nine months later. The first production aircraft was delivered in February 1945 and the first squadron, VF-19, was operational by 21 May, but World War II was over before the aircraft saw combat service. Postwar, the F8F became a major U.S. Navy fighter, equipping 24 fighter squadrons. Often mentioned as one of the best-handling piston-engine fighters ever built, its performance was sufficient to outperform many early jets. Its capability for aerobatic performance is illustrated by its selection for the Navy's elite Blue Angels in 1946, who flew it until the team was temporarily disbanded in 1950, during the Korean War. The F9F Panther and McDonnell F2H Banshee largely replaced the Bearcat in USN service, as their performance and other advantages eclipsed piston-engine fighters. An unmodified production F8F-1 set a 1946 time-to-climb record (after a run of 115 ft/35 m) of 10,000 ft (3,048 m) in 94 seconds (6,383 fpm). The Bearcat held this record for 10 years until it was broken by a modern jet fighter (which still could not match the Bearcat's short takeoff distance). Other nations that flew the Bearcat included the French Air Force and Royal Thai Air Force. French aircraft saw combat service against the Viet Minh in the First Indochina War as fighter-bombers in the early 1950s.They were used to support French Forces at the Battle of Dien Bien Phu, operating at the edge of their combat radius, but failed to prevent the French defeat that brought about the end of the war. Upon its creation in 1955, nearly 70 surviving aircraft passed to the Vietnam Air Force. 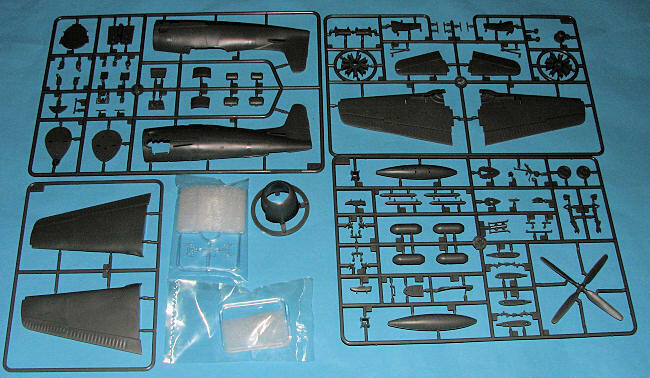 Always nice to see a new kit and this one from Hobby Boss looks to be a good one. Undoubtedly, this one is based on the 1/32 Trumpeter kit, about which much bemoaning about several 'fatal flaws' was heard. Whether those have carried across to this kit is unknown, but I am sure you will have no difficulty finding out. 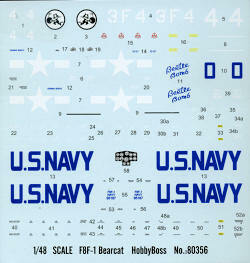 One would think that with the Hobby Craft kit being available that a new Bearcat would not be required. Regardless, this one is very nice. It has crisp engraved detailing, including the engraved rivet pattern that some love and others hate. The cockpit is quite well appointed offering raised instrument detailing and a decal for the main instrument panel. A full accessory section behind the engine is also provided. Apparently one can see this through the opening in the wheel wells. The engine looks a bit generic, but for most is well detailed enough to pass inspection. Nicely done wheel wells are provided and like its 1/32 cousin, the tail wheel gear is bulkheads on either side. This will need to be installed prior to closing the fuselage halves so care will be needed to protect the tail wheel. The tail hook simply slides in place so you can pose it extended should you wish. A nice touch is the option to fold the wings. One will need to cut along the hinge lines on the wings to accomplish this. Wing formers and hinges are supplied for this option. For things under wings, there are two bombs and four rockets. A centerline tank is also provided. Unfortunately, Hobby Boss has already opened up the holes and slots for these things so you will need to fill them if you will not be using them. I really wish model companies would not do that. It takes no effort to open these slots and so much effort to close them. Markings are for two planes. 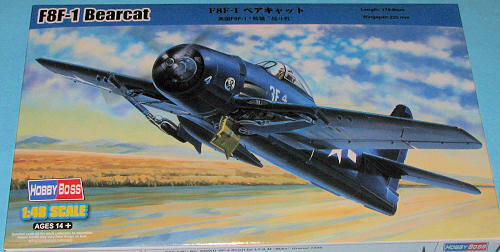 One is the box art aircraft with VF-3 from 1946 in overall sea blue. The other is 'Beetle Bomb', the solo display plane of the Blue Angels in 1949. Though the painting guide shows it with full tanks and weapons, this plane was not normally armed so break out the filler. Decals look to be very well done. For those wanting something different, Starfighter Decals has recently issued a sheet with several -1 options on it. So we now have a more modern tooling of one of my favorite aircraft, the -1 Bearcat. Thanks to the additional detail in this one, it should turn out to make an excellent model for your collection. My thanks to Squadron Products for the preview kit. Get yours today at your local retailer.